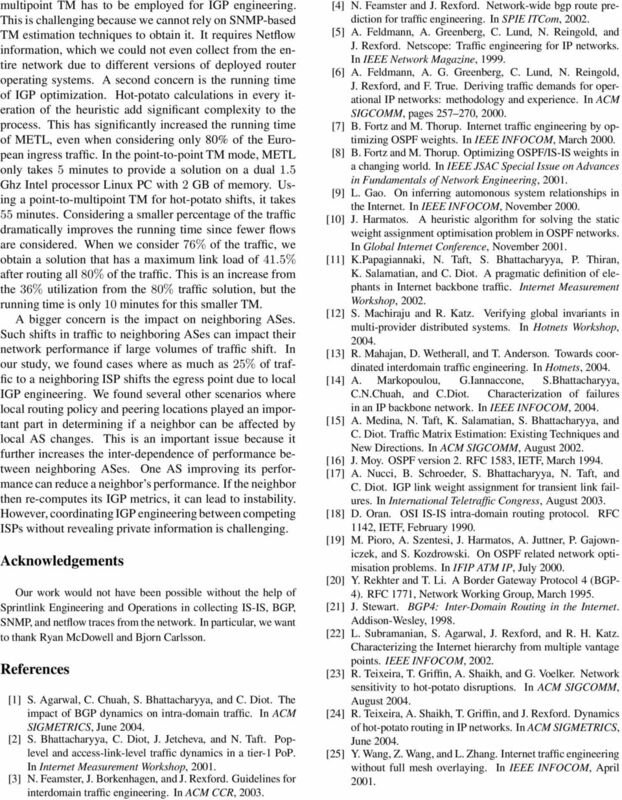 Download "Measuring the Shared Fate of IGP Engineering and Interdomain Traffic"
10 multipoint TM has to be employed for IGP engineering. This is challenging because we cannot rely on SNMP-based TM estimation techniques to obtain it. It requires Netflow information, which we could not even collect from the entire network due to different versions of deployed router operating systems. A second concern is the running time of IGP optimization. Hot-potato calculations in every iteration of the heuristic add significant complexity to the process. This has significantly increased the running time of METL, even when considering only 80% of the European ingress traffic. In the point-to-point TM mode, METL only takes 5 minutes to provide a solution on a dual 1.5 Ghz Intel processor Linux PC with 2 GB of memory. Using a point-to-multipoint TM for hot-potato shifts, it takes 55 minutes. Considering a smaller percentage of the traffic dramatically improves the running time since fewer flows are considered. When we consider 76% of the traffic, we obtain a solution that has a maximum link load of 41.5% after routing all 80% of the traffic. This is an increase from the 36% utilization from the 80% traffic solution, but the running time is only 10 minutes for this smaller TM. A bigger concern is the impact on neighboring ASes. Such shifts in traffic to neighboring ASes can impact their network performance if large volumes of traffic shift. In our study, we found cases where as much as 25% of traffic to a neighboring ISP shifts the egress point due to local IGP engineering. We found several other scenarios where local routing policy and peering locations played an important part in determining if a neighbor can be affected by local AS changes. This is an important issue because it further increases the inter-dependence of performance between neighboring ASes. One AS improving its performance can reduce a neighbor s performance. If the neighbor then re-computes its IGP metrics, it can lead to instability. However, coordinating IGP engineering between competing ISPs without revealing private information is challenging. Acknowledgements Our work would not have been possible without the help of Sprintlink Engineering and Operations in collecting IS-IS, BGP, SNMP, and netflow traces from the network. In particular, we want to thank Ryan McDowell and Bjorn Carlsson. References  S. Agarwal, C. Chuah, S. Bhattacharyya, and C. Diot. The impact of BGP dynamics on intra-domain traffic. In ACM SIGMETRICS, June  S. Bhattacharyya, C. Diot, J. Jetcheva, and N. Taft. 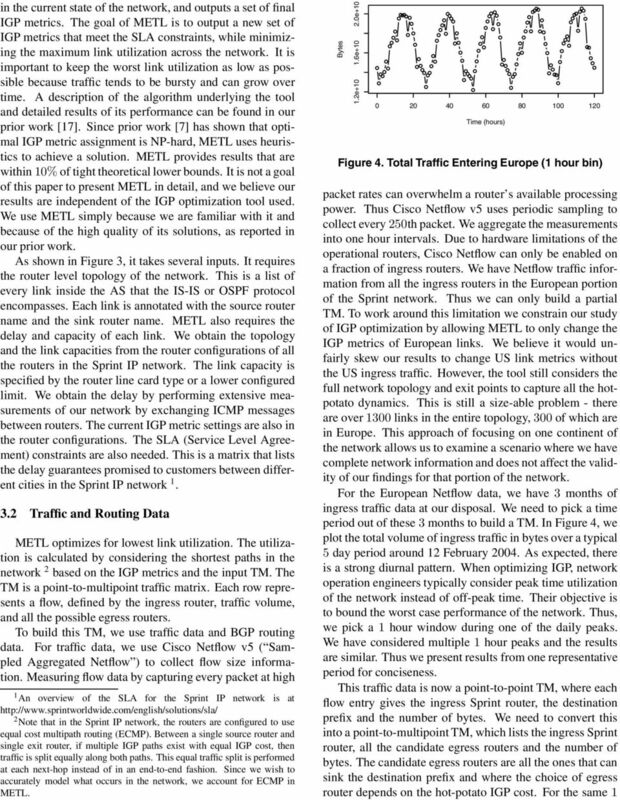 Poplevel and access-link-level traffic dynamics in a tier-1 PoP. In Internet Measurement Workshop,  N. Feamster, J. Borkenhagen, and J. Rexford. Guidelines for interdomain traffic engineering. In ACM CCR,  N. Feamster and J. Rexford. Network-wide bgp route prediction for traffic engineering. In SPIE ITCom,  A. Feldmann, A. Greenberg, C. Lund, N. Reingold, and J. Rexford. Netscope: Traffic engineering for IP networks. In IEEE Network Magazine,  A. Feldmann, A. G. Greenberg, C. Lund, N. Reingold, J. Rexford, and F. True. 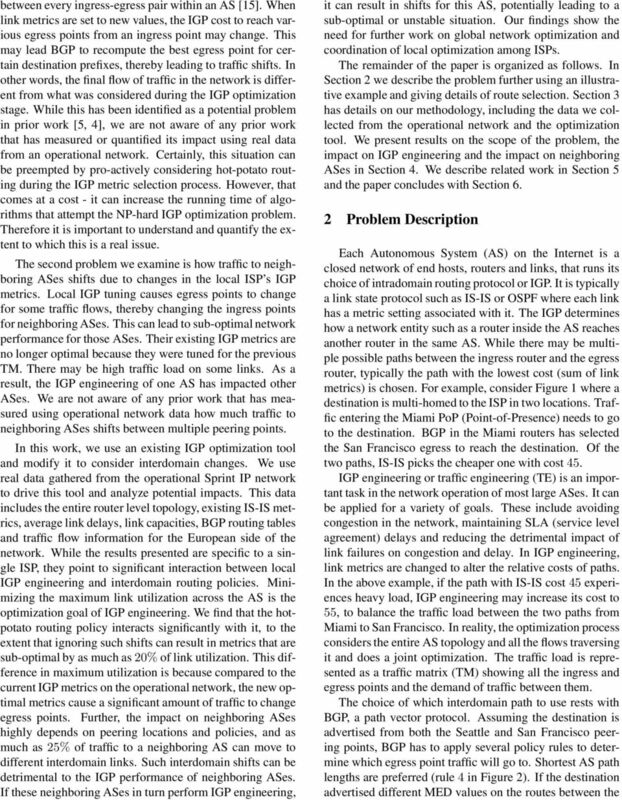 Deriving traffic demands for operational IP networks: methodology and experience. In ACM SIGCOMM, pages ,  B. Fortz and M. Thorup. Internet traffic engineering by optimizing OSPF weights. In IEEE INFOCOM, March  B. Fortz and M. Thorup. Optimizing OSPF/IS-IS weights in a changing world. In IEEE JSAC Special Issue on Advances in Fundamentals of Network Engineering,  L. Gao. On inferring automonous system relationships in the Internet. In IEEE INFOCOM, November  J. Harmatos. A heuristic algorithm for solving the static weight assignment optimisation problem in OSPF networks. In Global Internet Conference, November  K.Papagiannaki, N. Taft, S. Bhattacharyya, P. Thiran, K. Salamatian, and C. Diot. A pragmatic definition of elephants in Internet backbone traffic. Internet Measurement Workshop,  S. Machiraju and R. Katz. Verifying global invariants in multi-provider distributed systems. In Hotnets Workshop,  R. Mahajan, D. Wetherall, and T. Anderson. Towards coordinated interdomain traffic engineering. In Hotnets,  A. Markopoulou, G.Iannaccone, S.Bhattacharyya, C.N.Chuah, and C.Diot. Characterization of failures in an IP backbone network. In IEEE INFOCOM,  A. Medina, N. Taft, K. Salamatian, S. Bhattacharyya, and C. Diot. Traffic Matrix Estimation: Existing Techniques and New Directions. In ACM SIGCOMM, August  J. Moy. OSPF version 2. RFC 1583, IETF, March  A. Nucci, B. Schroeder, S. Bhattacharyya, N. Taft, and C. Diot. IGP link weight assignment for transient link failures. In International Teletraffic Congress, August  D. Oran. OSI IS-IS intra-domain routing protocol. RFC 1142, IETF, February  M. Pioro, A. Szentesi, J. Harmatos, A. Juttner, P. Gajowniczek, and S. Kozdrowski. On OSPF related network optimisation problems. In IFIP ATM IP, July  Y. Rekhter and T. Li. A Border Gateway Protocol 4 (BGP- 4). RFC 1771, Network Working Group, March  J. Stewart. BGP4: Inter-Domain Routing in the Internet. Addison-Wesley,  L. Subramanian, S. Agarwal, J. Rexford, and R. H. Katz. Characterizing the Internet hierarchy from multiple vantage points. IEEE INFOCOM,  R. Teixeira, T. Griffin, A. Shaikh, and G. Voelker. Network sensitivity to hot-potato disruptions. In ACM SIGCOMM, August  R. Teixeira, A. Shaikh, T. Griffin, and J. Rexford. 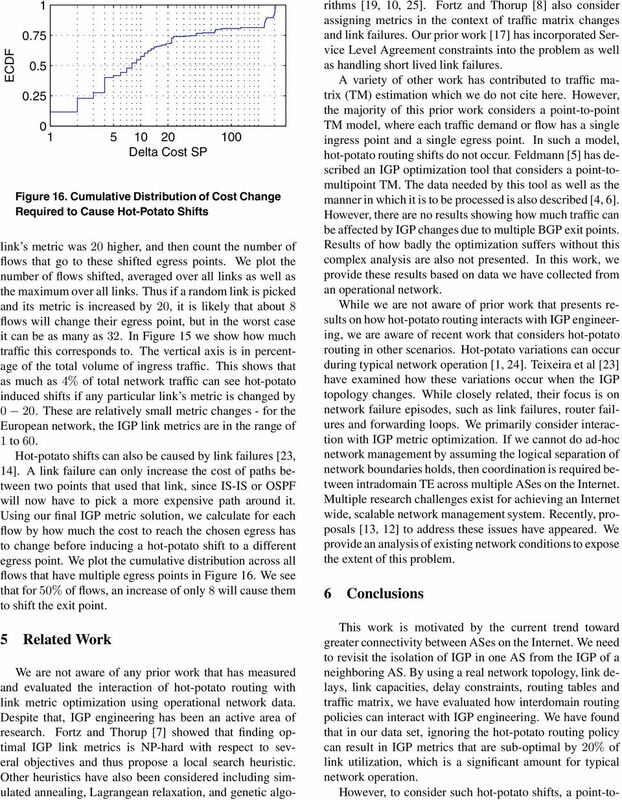 Dynamics of hot-potato routing in IP networks. In ACM SIGMETRICS, June  Y. Wang, Z. Wang, and L. Zhang. Internet traffic engineering without full mesh overlaying. In IEEE INFOCOM, April 2001. BGP route propagation. Internet AS relationships, Routing policy on Internet paths. Example of commercial relationship. Transit vs.
Lecture 18: Border Gateway Protocol"